Chances are, if you're a metalhead who knows at the very least that Sweden had/has an incredible death metal scene, then I don't need to go on about all of the bands and how there were myriads of fantastic bands that never got past the demo stage. 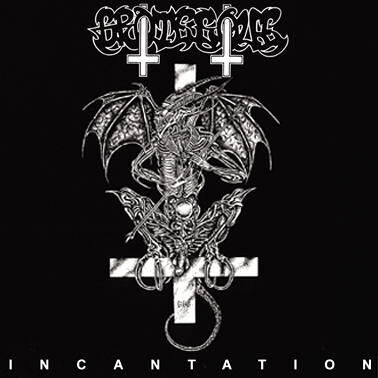 Grotesque is one of those unfortunate casualties, as they have never released a full-length, but luckily they've left us with this terrific five-track EP "Incantation." Whether or not this EP is considered widely influential in the metal underground is beyond me, but I definitely hear a lot of the newer groups out today with plenty of Grotesque in their music (Tribulation, Zombiefication, Putrified, etc), so it's definitely within the realm of possibility, especially when considering that these Swedes didn't exactly have the same d-beat/punk influence, nor did they have the chainsaw tone (though, it was still a pretty thick and heavy tone) that their comrades had, and a lot of the music here was driven by the insane riffs and intense drumming, more akin to the American style. The self-titled opening track features plenty of different styles in the opening minutes, featuring some dark melodies, tremolos, and some thrashy riffs to get the listener's headbanging. The rest of the song follows suit, with an abundance of different riffs and some great vocals which are another highlight on "Incantation." I may not be the biggest fan of At the Gates (Or the subgenre that they play), but there is no denying that Tomas Lindberg (Or as he's known in Grotesque, Goatspell) can conjure some vile vocals that are absolutely perfect for fronting a band the caliber of Grotesque. What transpired on the first track is pretty much the entire story of this EP. The band did a brilliant job of structuring the music with a solid mix of thrashy riffs, death metal tremolos, melodies and an overall eerie atmosphere. "Submit to Death" and "Blood Runs from the Altar" are a couple of the more thrash-oriented tunes, but they're fronted by a death metal vocalist whose vocals could shatter glass. "Spawn of Azathoth" is an all-out blitzkrieg of intensity and if your head isn't banging, seek help. "Nocturnal Blasphemies" is probably the most "unique" song on this EP, as it features some riffs that have glimpses of technical patterns, but it's also one of, if not the darkest song here. So, the story here with "Incantation" and Grotesque isn't a new one, just one that I enjoy revisiting, because who doesn't love a little band that didn't make it as big as they should have? I know I do. "Blood Runs from the Altars"